We offer a wide array of premium quality faucets ideal for any kitchen decor. These attractive, functional and affordable faucets are engineered to provide long service and superior performance. This Single Lever Pull Out Faucet has clean lines and a sleek design that create a minimalist look with maximum visual impact. With exceptional functionality, the pull-down sprayhead is ergonomically designed with a comfortable grip and offers additional functionality and maximizes the range of motion. 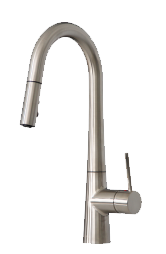 The spout swivels 360° for added flexibility, providing the ability to reach beyond every part of the sink. A single oversized button allows you to instantly switch between aerated stream and spray, with a locking option for added convenience. This faucet has been manufactured with top-quality components in order to ensure lasting value and superior performance and only certified lead free material. 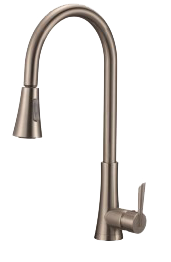 Give your kitchen sink an elegant touch with the Palermo Single Handle Single Hole Kitchen Faucet with Pull Down Shower Spray. 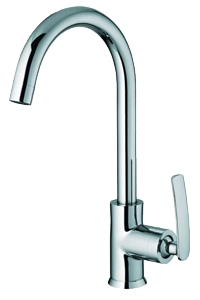 Made with certified lead free material, this faucet is sturdy and durable. This faucet comes in brushed stainless steel finish that will blend well with your kitchen decor. 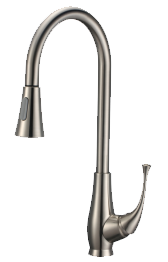 This Bari Kitchen Faucet will add a statement to your kitchen. Whether you have contemporary or a transitional style, this faucet will match perfectly with your décor. With exceptional functionality, the pull-down sprayhead is ergonomically designed with a comfortable grip and offers additional functionality and maximizes the range of motion. 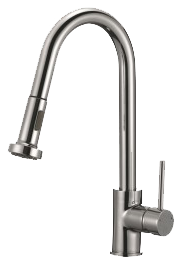 The spout swivels 360° for added flexibility, providing the ability to reach beyond every part of the sink. A single oversized button allows you to instantly switch between aerated stream and spray, with a locking option for added convenience. With a streamlined design and flexible functionality, this pull-down faucet is the perfect fit for your kitchen. Sleek lines and soft curves create a beautifully balanced silhouette that suits a range of styles, from classic to contemporary. 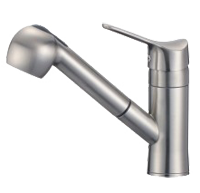 This versatile faucet features an ergonomic pull-down spray head and single-lever handle for effortless flow control. The dual-function sprayer with flexible smooth-retract hose switches between aerated stream and powerful spray. This beautiful and elegant pull down kitchen faucet will bring a touch of minimalist style to your kitchen. The Toscana Commercial Style Faucet has a clean, modern double-coil design that suits any kitchen décor, from classic to contemporary. An innovative double spring offers additional reinforcement for the ergonomic spray head. The dual-function sprayer has been designed to easily switch between aerated stream and spray water flow. This faucet has been manufactured with top-quality components in order to ensure superior performance and durability. 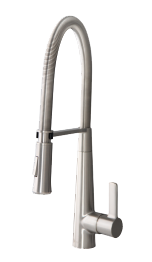 This model includes a Kerox ceramic cartridge for lasting drip-free use, and a best-in-industry Neoperl aerator that reduces water waste without sacrificing pressure. The soft rubber nozzles in the spray head will prevent hard water and lime scale build-up, making maintenance easy. For easy installation, mounting hardware are included with purchase. 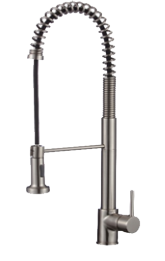 This elegant faucet will add a final touch to your industrial look kitchen.